Going to the grocery store can be an entertaining adventure in Mexico! We enjoy exploring the culture through their food - and visiting a grocery store is an excellent start on that journey. The most obvious "adventure" lies in the different proteins consumed in Mexico - in Playa del Carmen you will see an abundance of seafood that is unusual to find even in a seafood shop back home. Octopus, squid, giant squid and exotic fish are just some of the unusual sights on ice in the seafood section. In the beef and pork section, it gets even more odd - Mexicans, like many other cultures, eat most organs and other parts of the animals that Americans would never consider eating. So this is your chance to gaze upon beef tongue, brains, eyeballs, and anything else that you can think of. Twelve year old boys will especially enjoy this activity! Refrigeration (or the lack thereof) makes for another significant difference. In Mexico, eggs are stored in the aisles and not refrigerated. Obviously, this is OK as it is the only way you will see eggs here. But it makes me wonder what it is about OUR eggs at home that require cold storage? Anyone know? Milk is one of the other things sold off of the shelf - it is sold in boxes off the shelf instead of plastic bottles in refrigerated cases. I have been told that this milk is processed with extremely high heat which somehow results in no refrigeration needed. You can buy boxed milk in the U.S., I have some at home saved for when I run out - great option! Once it is opened, however, even boxed milk needs to be refrigerated. A delightful place in a Mexican supermarket is the fresh bakery! All kinds of pastries and goodies are placed out in the aisles. Grab a pizza tin and a pair of tongs and go through the aisles choosing what you want. When you're done loading up your tin, take it to the counter where a lady will put it in bags for you and place the price on the bag. Very inexpensive and good. I prefer the ones with sugar or chocolate on them, as Mexican breads and pastries are not as sweet as what we eat in Texas. In the larger stores such as Mega and Wal-Mart, you can find most anything your heart desires and is used to from home, but it may not be available in the brand you are accustomed to. Of course, Mexican brands will cost you much less, but American brands are there too for many items. If you have a child who must have peanut butter, however, bring a jar from home. For some odd reason, we have trouble finding this in stock when we are there. Nutella is more widely available as an alternative. 1 of 2 lime sections at the grocery store in Playa del Carmen, Mexico! And don't forget to spend some time in the produce section. 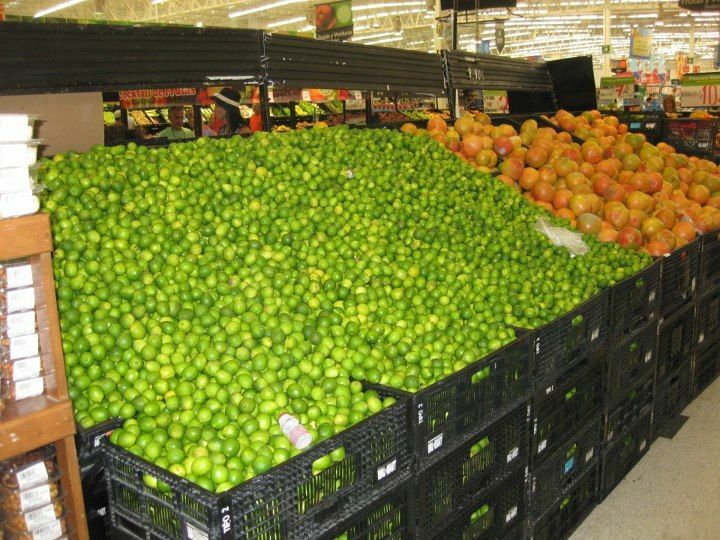 You won't believe the number of limes displayed!! Along with many other tropical, tasty fruits and vegetables. Pick up something you aren't familiar with to sample back at the condo. But remember to soak ALL fruits, veggies and greens in the sink with a few disinfectant drops first. And note that produce doesn't stay fresh long in Mexico, so only buy what you will eat today and tomorrow, then make another trip. Open your mind to the experience and enjoy something new! After 10 years of vacationing in the Riviera Maya, Laurie and Mark Ritchel bought their own little slice of paradise in Playa del Carmen in 2008. Their time there has instilled in them a love of the Mexican people and their culture, and an appreciation for their approach to daily living. While they hope to semi-retire in Playa eventually, for now they are content with vacation time whenever they can escape their full time jobs in Texas. When they are not in Mexico, they love sharing their Playa home, Casa de Sueno, with others and especially enjoy helping new and old friends alike to make the most of their visits to the area. 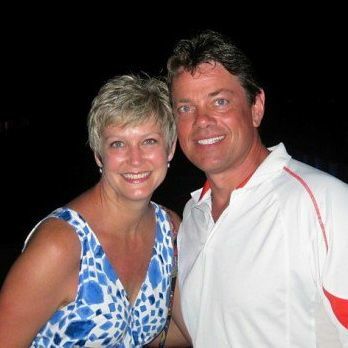 Laurie is employed as a fundraiser for Lamar University in Beaumont, Texas.